We know that leaving children and pets in the car is dangerous on a hot day. But, did you know that it could be risky to leave your water bottle in the car for an extended period of time? Most of the billions of plastic water bottles used in the US yearly are made out of polyethylene terephthalate. When this material is heated (like in the cup holder of your hot car), it can release chemicals antimony and bisphenol A, which is commonly known as BPA. According to the International Agency for Research on Cancer, these chemicals could be carcinogenic and harmful to your health. But, Jane Sadler, MD on the medical staff at Baylor Medical Center Garland said that BPA isn’t the only concern when it comes to plastic water bottles and extreme heat. 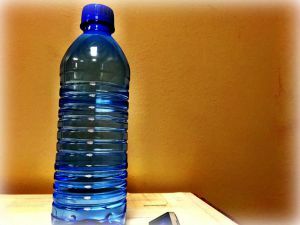 Because of the bacteria and chemicals that could be floating around inside your water bottle, the doctor said it is important to use them for their intended purpose. This means tossing out those disposable water bottles and washing your reusable ones thoroughly with hot, soapy water after each use. And if you’re sending your kids back to school with a reusable bottle of water to keep them hydrated, make sure they are washing their hands before and after they drink from their bottle. This will help keep germs they pick up on school surfaces from getting into their drinking water. It might also be helpful to purchase a reusable water bottle that is BPA-free. This will mean less worry for you and more hydration for your family. Healthy Eating	Will required menu calorie counts curb eating?